Of late, brands are exploring means and mediums to engage with their customers as frequently and as innovatively as possible. Among the many popular mediums, social media is emerging as the preferred route to connect with consumers. Last year for its Spring-Summer campaign, Ted Baker launched ‘Keeping up with the Bakers’ – an eight-part sitcom that played out episodically over Instagram. Users were encouraged to come back daily to partake in daily challenges which were released with each episode. H&M’s ‘Close the Loop’ advertisement is another example of the brand’s innovative marketing. With the aim of promoting its mission to make fashion more sustainable, it created one of the most diverse ads of all time. Featuring plus-size model Tess Holliday and Muslim model Mariah Idrissi the ad garnered a massively positive response for its celebration of different cultures in relation to fashion. Similarly, Lacoste launched a short film, ‘Timeless’ that take viewers on a visual journey through its fashion past. Lacoste has a long history, having been founded in 1933 by tennis player René Lacoste and André Gillier. The brand uses a narrative arc to tell the story of two star-crossed lovers who are pulled through multiple decades in a single train journey. Combining nostalgia, urgency, and intrigue – it packs a lot into less than two minutes. The 2015’s ‘Better for It’ Nike campaign is one of the most memorable in recent years. Depicting the inner thoughts of women during sporting activity, it highlights the correlation between sport and self-esteem, and cleverly hints at how what we wear can also have a bearing. With a light-hearted but empowering tone, it succeeded in engaging female consumers. On the domestic front, Being Human Clothing’s #5Years Of Being Human Clothing anniversary campaign was one of the most successful and innovative advertising campaigns. 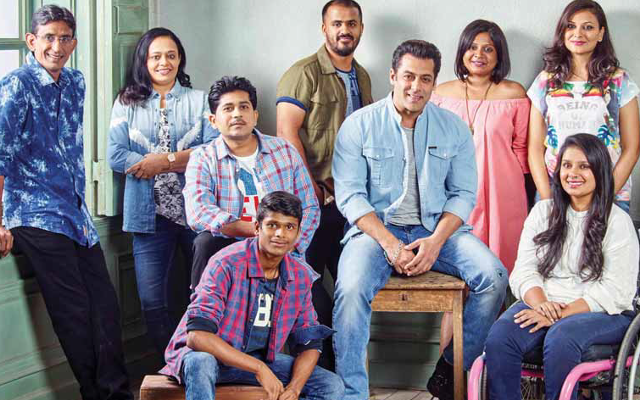 The brand featured Salman Khan and 8 unsung heroes from distinct fields. The campaign was shot by the renowned photographer Prasad Naik and conceptualised by the agency Pulp. #5YearsOfBeingHumanClothing celebrated inspirations breaking through societal taboos bringing in eight crusading champions and their unheard stories. This initiative by the brand stands for and believes in being brave, being courageous and most of all, being an awesome human. According to Neha Shah, AGM – Marketing, Pepe Jeans, every innovation in retail is now about designing an experience that’s remarkable and creates value that keep bringing the ‘discerning’ customers back. Shoppers are critical influencers thanks to the incredible growth of social media networks and mobile commerce. To turn the ‘increasingly digitally connected’ customer into a brand advocate and to drive sales, retailers recognise the need to be five steps ahead at all times. “For us at Pepe Jeans, innovation is at the heart of everything that we do. In an endeavour to give the customer an opportunity to be involved in the design process and provide a unique retail experience Pepe Jeans launched the first of its kind denim customisation service – Pepe Jeans Custom Studio. Customisation has always been a huge trend internationally, but we saw immense opportunity in bringing this concept to India,” she shares. At Pepe Jeans Custom Studio, customers can walk into the stores and design their own denims. They can choose from a variety of studs, quirky badges, as well as distress and rips according to their preferences. With the laser functions, customers can also choose images or text to get printed on their denims in just a few seconds. This year, Pepe Jeans wanted to create a larger than life campaign as the brand launched its first ever India’s brand ambassador, Bollywood actor Sidharth Malhotra. With an aim to make this campaign a diverse one, Pepe Jeans worked on a 360 degree marketing plan to publicise the campaign across all platforms, especially social media. The media event took place on March 7, 2018 at High Street Phoenix, Mumbai with media, fashion bloggers and influencers all in attendance. Post the event, the campaign starring Sidharth Malhotra went live on Pepe Jeans’ social media handles including Facebook, Twitter and Instagram. This activity along with images from the event posted by bloggers announcing Sidharth Malhotra as the face of the brand alone garnered a cumulative social media reach of 7.5 million across Pepe Jeans social media accounts Twitter, Facebook and Instagram. One of the most thoughtful promotional activities is the ‘Project Girl Power’, a spirited campaign initiated by Ayesha Accessories to build a strong community of empowered discerning young women. It’s a movement to inspire independence, confidence and boldness in women and girls, regardless of their age, background and the way they choose to express their femininity. Every person who walks into an Ayesha store receives self-affirming messages such as ‘Yes I Can’; ‘It’s Me Who Decides’; and ‘Unstoppable’. It is communicated through the brand’s store design, branding, social media, marketing material, photo shoots and a special product line. The campaign has been extremely popular, having been widely recognised in print media, social media and social influencers. Tens of thousands of stickers have been given out already and are being proudly displayed by Ayesha Accessories customers, symbolising their strong connection with the Girl Power movement. Of late, social media has totally revolutionised the way brands have been promoting themselves. Social Beat’s Digital Marketing Industry Report 2018 reveals the growing influence of digital marketing. It says that 68 percent of brands are currently using digital marketing in their promotional strategies, while less than 9 percent use print ads, radio and television. The report goes on to say that along with the increased use of digital marketing, brands are also beginning to allocate larger portions of their overall marketing budgets for digital. While 57 percent of brands surveyed spend less than Rs. 50,000 per month on digital marketing, as many as 21 percent spend between Rs. 50,000- 2 lakhs per month. Additionally, 33 percent of brands allocate more than 40 percent of their total marketing budget for digital marketing alone. This increase in digital spends is crucial for brands if they want to reach out to India’s next billion internet users in Tier II and III cities and towns. A digital marketing platform gives brands the freedom to communicate and engage with their existing customers while also targeting new ones, build its credibility and most importantly increase sales. “The reach this medium can provide is unlike any other and it also presents the brand an opportunity to keep reinventing itself like showcasing the new collections creatively season-on-season,” says Neha Shah. For Spring-Summer 2018, Pepe Jeans made an innovative approach towards promoting the season’s campaign. Titled #MadeToCreate, the campaign was centered on the need to bring to life something remarkable that is driven by one’s creative expression. The theme revolved around the innate desire to create art. For the campaign, the brand leveraged Custom Studio, Pepe Jeans’ customisation service that allows customers to step into the design seat and customise their denim in a few easy steps. The bloggers designed Pepe Jeans in their own distinctive style keeping in mind the campaign theme. From laser prints, to quirky badges and stud-work the influencers and bloggers developed beautiful denim creations that helped bring alive the #MadetoCreate campaign on social media. This activity received an astounding reach of 5.3 million across all Pepe Jeans’ social media platforms (Facebook+Twitter+Instagram). Neha Shah explains that the internet further gave social media the reach, which wasn’t possible 10 years ago. Fashion in the age of millennials and social media is different with influencers and bloggers are the new trend-setters. The internet has definitely changed their brand’s promotional strategy. With a strong focus on the millennial and Gen-Z demographic, they are recognising that fashion consumers have an entirely new set of expectations. To meet these shoppers where they live, we are deemphasising in favour of digital and online campaigns. “Social media has become a huge part of a customer’s journey. In fact it is the first step towards a brand when a customer keeps updated via social media for trends. Even for our brand, we have started focus on social media by creating relevant content and promoting to the right set of audience. Influencer marketing has also become a major wave in these times. We have collaborated with a few top influencers to promote our collections. With efforts to organically grow our social media we have seen new followers joining our community everyday,” says Asha Esther Jaikishan, Head of Marketing, Numero Uno. According to Jacqueline Kapur, President, Ayesha Accessories, the obvious impact of internet is that brands can have a much wider sales strategy. In terms of brand building, through social media posts, they can connect with existing and potential customers. “Ayesha Accessories has become an aspirational yet affordable brand, and this is largely due to the ability to portray the brand through social media and social influencers. This means that we directly speak and stay connected with our fans through personal responses via social media and text messaging. All our fans have direct access to the brand manager’s phone number and email,” she adds, saying that she personally chats with online consumers and replies to each and every query. “Social media is definitely not a new trend, but it is continuously evolving. High-end and luxury labels, large number of e-commerce websites, fashion magazines and everything in between are connecting with audiences through social media. Platforms like Facebook, Twitter, YouTube and Instagram are especially prevalent,” adds Kunal Mehta. Being Human Clothing has its presence on all major social media platforms. The combined social media reach of the brand is close to 8 lakh followers. These platforms helps the brand to reach and understand its target audience. “The younger fashion conscious audience are more accessible through these platforms and we take active efforts and try to engage with them. We have created a community called #BHTribe, which tag us and get featured on our social media platforms,” he says. The brand’s marketing team ensures that Ayesha Accessories has a fun and eye-catching presence on social media, with regular postings on Facebook and Instagram. To date, the brand has 3,30,000 followers on Facebook. Ayesha Accessories was the first Indian brand which brought the fashion accessory segment into organised retail market almost 10 years ago. Since then they have expanded the brand through our 2 sub-brands–’lil’ star’ for kids and ‘unknown’ for the cool young men. A further sub-brand, JQ will be launched soon. JQ targets the elegant millennial woman with a collection of high-quality designer jewellry all handcrafted in India. The brand is also working on further expanding their ethnic line from a small range to a full-fledged collection. Jacqueline Kapur also stated “We are still predominantly an offline company in Tier I and a few Tier II cities, but we have observed that a lot of online sales come through Tier III cities, which has led us to consider opening kiosks and smaller outlets in smaller cities. Today, the internet has a major influence on the fashion industry. Neha Shah acknowledges that India’s e-commerce market is expected to cross US$ 800 billion. The online space is growing at par with physical stores now. This will help brands to acquire new consumers as well as retain their existing market share. She emphasises on the fact that internet penetration is not only seen in urban areas but also in emerging markets. Organised players can now get a hold in these markets through this medium. It is also important to consider the buying behaviour of consumers in small towns which is different compared to consumers living in urban areas. They seek value, they have an affinity towards local culture, and are more conservative in their choices. In the last few years, the online delivery reach and speed in these areas has picked up making it an ideal time to target additional customers with the help of e-commerce partners. Pepe Jeans retails through 238 EBOs, 1,350 MBOs and 582 LFS counters. The brand sees the online as an opportunity wherein they can target newer set of audiences as well as increase awareness about the wide range of products the brand has to off er. Pepe Jeans is present on Amazon, Jabong, Myntra, Ajio and Cilory. Asha Esther Jaikishan also confirms that the internet has certainly helped Numero Uno to align better with its customers through the physical store network. The brand gathers live customer data and do analysis as per the buying behaviour of each customer to plan out their strategies. “The consumer who used to walk into a brick-and-mortar store is now trying to find ‘everything fashion’ just a click away. In light of these technologies, Being Human also felt the need to become exclusively available in the e-commerce arena,” says Kunal Mehta. Being Human Clothing launched its official e-commerce website www. beinghumanclothing.com in August 2018. “We are also planning to expand our online space internationally to reach out to our global consumers. So far the response on our website has been positive. We look forward to greater success through our online portal and presence,” he said. Apart from this, the brand also available on most of the popular retail sites like Flipkart, Myntra, Amazon amongst others. In examining witnesses, I learned to ask general questions so as to elicit details with powerful sensory associations: the colors, the sounds, the smells that lodge an image in the mind and put the listener in the burning house.